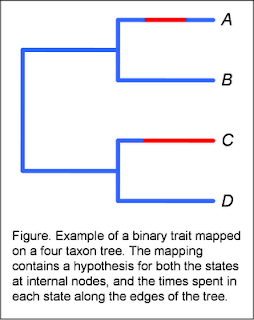 The tree above would correspond to the visual mapping of the figure, right, in which blue branches represent state "0" and red branches state "1." Note that doing this destroys all information about the order of states along edges. This information is unimportant for some analyses (such as O'Meara et al. 2006), but might be critical for others. We now simply call read.tree() on each of the state trees above to create a "multiPhylo" object which contains a list of the trees for each mapped state. 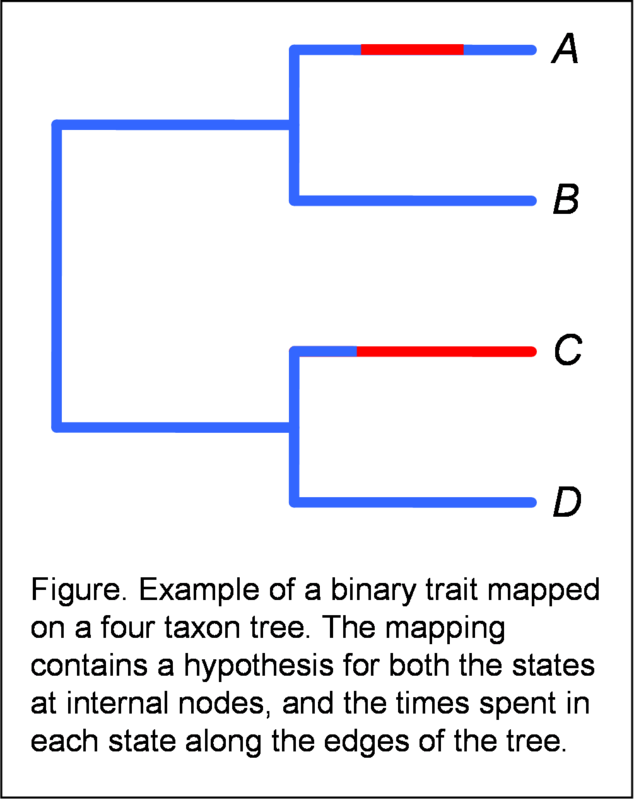 To create our SIMMAP tree in memory, then, we first copy the topology of any of the state trees in our list into our mapped tree (remember, they all have the same topology), and then we create a matrix mapped.edge with the time on each edge (rows) from each state tree (columns). These are just the $edge.length branch length vectors from each tree. We then add across columns of mapped.edge to get the total length of each edge. The product here is an object of class "phylo" but with the additional element, our matrix from earlier $mapped.edge, which contains the times spent in each state on each edge of the tree. And we're done! I should note that in creating this function I did in fact borrow and modify a chunk of code from the "ape" function read.nexus(). This allowed me to read not only Phylip style tree files, as given above, but also the more complicated Nexus style output files created by SIMMAP.